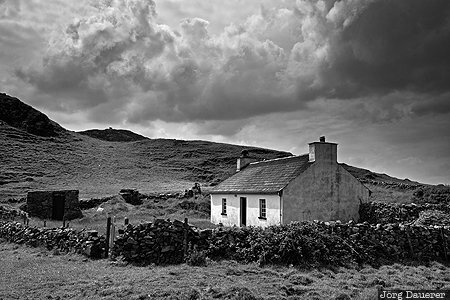 A lone white house near Boyeeghter Bay (locally known as Murder Hole Beach) below dark clouds. Boyeeghter Bay is in Donegal in the north of the Republic of Ireland. This photo was taken at noon on a cloudy day in June of 2016. This photo was taken with a digital camera.